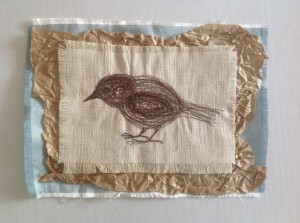 Beverley Speck is a textile artist and designer who creates a range of beautiful home decor pieces and original textile art. Her range of Christmas decorations features in the 2013 Country Homes and Interiors Magazine Calendar. Beverley took a break from her busy schedule to tell us a bit more about her textile business. 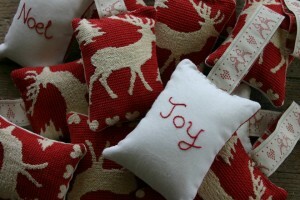 My name is Beverley Speck and I have a passion for creating, especially beautiful textiles. I design and make textile gifts and art, which are inspired by the beautiful flora and seascapes around our island. 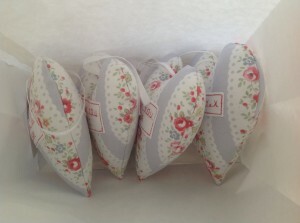 From cushions, lavender hearts, key rings and hanging signs to cards and pictures. I also spend half the year on my popular christmas decoration collection. I love to create gifts that people will treasure. I learnt to sew by watching my talented mother as a little girl. When I had my own children I taught myself to make things for them, like their room blinds, cushions etc. When my third child went to nursery I began making things for my friends, then their friends and my work has snowballed from there. I'm thrilled that my first customers from 8 years ago still come back time and time again to buy gifts. 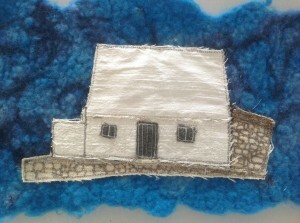 I use the sewing machine much as an artist uses a pencil to embroider pictures. I have recently created a collection based on the National Trust Property Le Don Hilton and the surrounding area. (The building is known locally as The White House in St Ouen). I have a springer spaniel who demands a nice long walk every day, so I often create pieces based on what I see as I walk, such as the boats in the harbour, sea birds or flowers in the hedgerows. I also think Jersey is the most beautiful place in the world so I often create pieces that have Jersey on them such as my Jersey cushions or 'I love' (Jersey, St Ouen, Gorey etc) key rings. 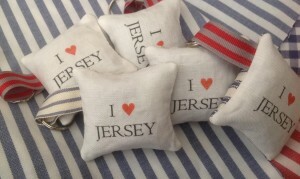 Local people love to give these as gifts and visitors like to buy them to take a little bit of Jersey home with them. A typical day would start around 7.30 when I go into my work room at home. Usually working on a shop order. I work through till lunch by which time my dog will be demanding to be taken out. After lunch I will work till my children arrive home on the bus around 4.00pm. I will sometimes carry on in the evening if my workload is particularly heavy or if paperwork needs to be done. On Fridays my work routine is slightly different as I use the time to develop new ideas or sketching for new pictures and out delivering orders. People seem to love my Jersey cushions or anything that contains local lavender. My customers often bring me their garden clippings of lavender for me to use in my work. Recently, my free machine stitched artwork has grown in demand which is particularly pleasing as I wasn't able to take art at school. 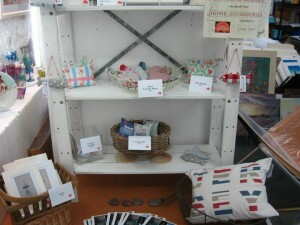 Beverley has her own selling space downstairs at The Harbour Gallery. You can also find her work at Jane James Coastal Ceramics (both in town and Gorey), Rococo in Liberty Wharf, Pour Moi in Rozel Bay, Jersey Lavender Farm gift shop and the National Trust property 16 New Street. For more information about Beverley and to keep up to date with her new work, follow her Facebook Page: Beverley Speck.